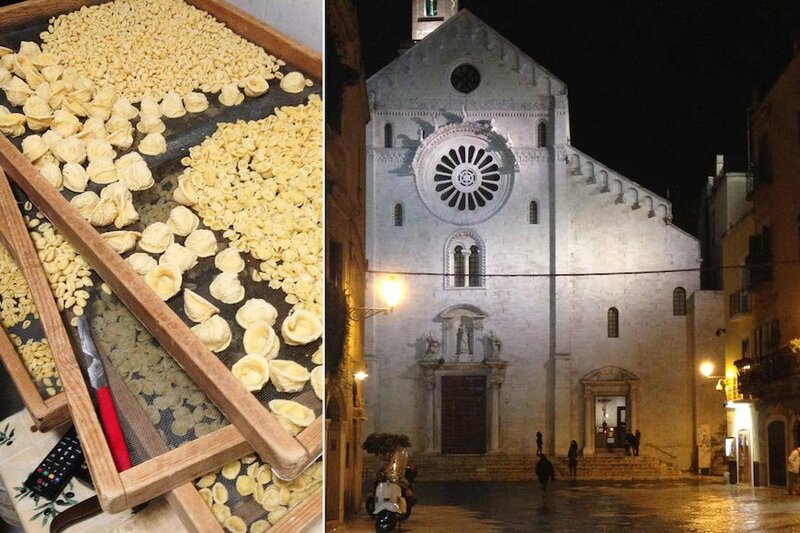 The makings of a Bari fable: handmade orecchiete (ear-shaped pasta) and Basilica San Nicola. All photos by Erica Firpo. In the Italian Adriatic port city of Bari, the food — and the people who make it — weave a sensory tale. Contributing editor Erica Firpo takes folklore icon Italo Calvino along as her unexpected travel companion. BARI, Italy – There are two Marias: a Nunzia and a tiny street where women make pasta all day and night. That sounds like the beginning of that my nonno used to read to me — incredulous stories of mean men with no noses, clever old witches, picky young women, persistent princes, outrageous problems, and even more outrageous endings. But it's not. Instead, I am walking around Bari Vecchia, the historic center of Puglia's largest port city on the Adriatic Coast. This place is a delicious and living food fable. In a tiny alley called via dell'Arco Basso, women of all ages spend their days and evenings mixing, rolling, cutting, and drying Bari's bounty: beautiful handmade pasta of varying sizes that will go into my mouth and on the tables of houses and restaurants throughout the province. Orecchiette, cavatelli, flour pasta, chick pea flour pasta. This is their job, life, and love. I can't help but feel like one of Calvino's capricious characters, maybe the girl from "And Seven!" (the fifth story in the Italian Fables collection). I peek through windows and stick my head into open doors, gazing in awe as they make and organize thousands of tiny, ear-shaped pasta. Around the corner is Basilica of San Nicola, a Romanesque church and reliquary of Bari's patron saint. I quickly run in to catch a glimpse of the "miraculous column" which allegedly can add a boost to the love life. San Nicola (aka St. Nick, Santa Claus, protector of children and sailors) is also the patron saint of unmarried women. He gets two shout-outs in Bari every year, with celebrations from May 7-9 and on December 6. Bari's pasta ladies make a local sweet called cartellate, wheel-shaped Christmas cookies for the celebration and for the Christmas season, which the city whole-heartedly celebrates. On December 6, single women dance three times around the lucky column for a love life pick-me-up. I look around for "Silver Nose" (story #9), but don't see him. With a quick salute to Santa, I'm out the door, following the smell of fried something down another narrow side street to via dell'Arco di San Nicola. I meet Maria throwing polenta squares called sgagliozze into what looks like a boiling cauldron in her ground-level kitchen. She is exactly whom I envisioned when listening to the tale of Prezzemolina, a no-nonsense strega-nonna, bosomed, aproned, and armed with a pair of tongs. 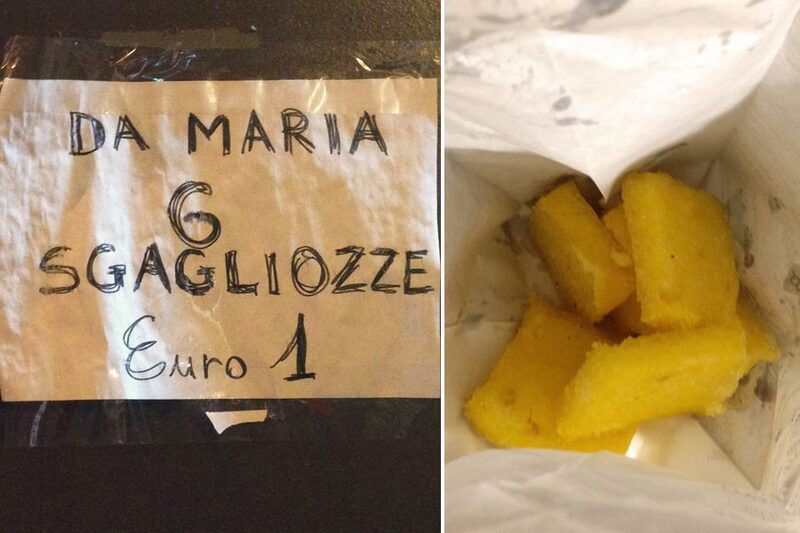 Maria has been deep-frying sgagliozze since the 1970s. She throws some salt on them (they look "Dear as Salt," I tell myself – story #54) and hands me a bag of six for 1 euro. I am bewitched.